WELCOME TO THE PAGE WHERE YOU CAN BUY TOURMALINES IN ALL COLORS. An Introduction to Loose Tourmaline Gems -Tourmaline is one the stones which has an outstanding color range like green, pink, blue, black and olive and this is the reason people get confused about its color. The etymology behind the word “Tourmaline” reflects one of its properties. It comes from the word “Tura Mali” which is a Sri Lankan word that stands for “Mix Color Stones”. In the beginning, this stone was indeed mistaken for the “Emerald” from the 1500s to 1800s. After the 1800s scientists tested the ingredients, crystal structure and chemical composition of this gem and declared it as a distinct mineral species. The crystal structure of Tourmaline matches to different colors and has only the difference of a few physical and chemical properties. 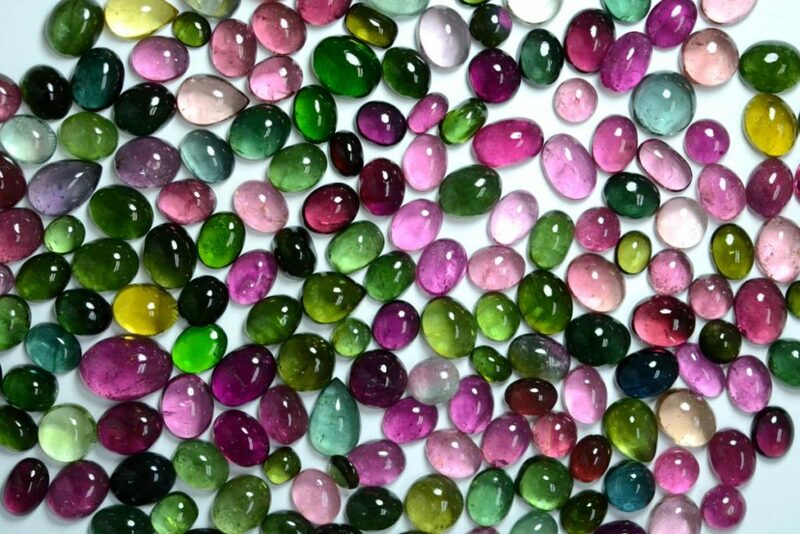 Navneet Gems and Minerals is a wholesale supplier of Loose Tourmaline Gemstones, these include our Wholesale Tourmaline, Wholesale Pink Tourmaline, Wholesale Green Tourmaline, Wholesale Indicolite Tourmaline, Tourmaline Cabochons, Tourmaline Loose Gemstones and Tourmaline single pieces in all colors of Green, Blue and Pink. 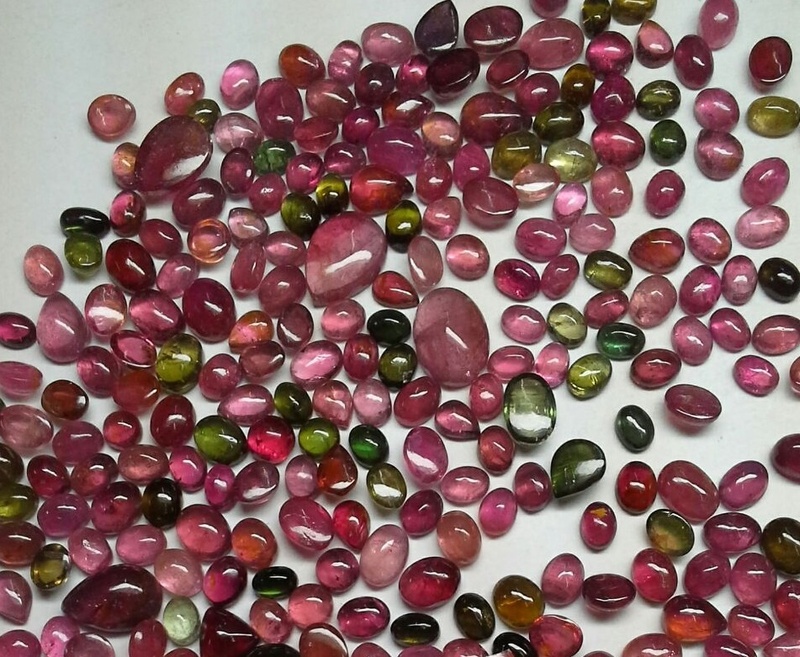 We import Multi Tourmaline directly from where they are mined chiefly and glaze them for our clients at our own manufacturing units which are situated at Thailand and India. Our expert craftsmen use advance tools to shape the gemstone and make it beautiful. We slice it in round shape, pear shape, teardrop shape, cushion cut, drop shape, oval shape, stick shape, in needle drop shape, slice drop shape, tri-tube shape, faceted rondell shape, faceted slab shape, trapezoid shape, heart shape, wheel shape, etc. and we also customize it according to the requirement of our customer. Paraiba Tourmaline is quite a rare stone and demand is so high, that it is a high priced stone and only a very few companies do stock it. Mozambique, Brazil, Nigeria and some other countries are known for availability of raw material of this stone. It was first discovered in Nigeria then Brazil and Mozambique. 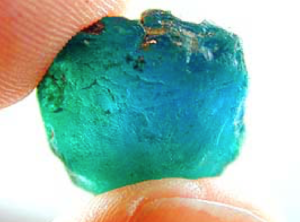 Mozambican Paraiba Tourmaline is bluer and cleaner. 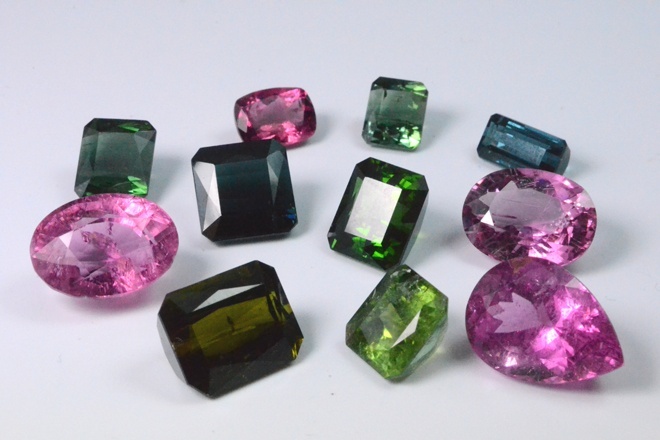 How do you choose the best quality of Tourmaline Faceted and Cabochons Gemstones? Transparency, color, size, shape and quality are factors to know to pick a best tourmaline piece. Transparency – Tourmaline is a transparent to translucent stone. Top quality pieces come with 0% opacity with good saturation of color. If a stone is less transparent with good saturation of color then the price will not be high for that piece so TRANSPARENCY is the most important factor. Color – We will divide it into two sections – one is the different color of Tourmaline and the other one is the color saturation of Tourmaline. This stone comes in wide and amazing range of colors like candies 😉 and price for every color is different. Paraiba, Blue (Indigolite), Pink, Green and then others (Black, yellow, olive etc.) come in order based on value. “Perfect Color Saturation” is very important. Sometimes buyers think that darker is more valuable but it is not. If any stone is very dark and giving a blackish tone then it will be least valued. Shape and Size – Oval, Round, cushion, long baguette and triangular cut are popular shapes in Tourmaline. We have been cutting all small 2mm round faceted or cabochon to 12mm and up sizes in different and sizes in our factory. Micro sizes are very famous in pink and green color and widely used in jewelry, sometimes it is used to replace pink sapphire to minimize the total cost of jewelry piece. Over 5 carats sizes are high in price because big size raw material is not easily available. You can contact us at info@navneetgems.com if you want to buy Tourmaline at affordable prices. We will also edify you if you want to know more about it. Navneet Gems and Minerals is located in Thailand, with our headquarters here in Bangkok and also have our manufacturing units in both India (Jaipur) and Chantaburi (Thailand), where we are producing all varieties of Tourmalines. The cabochons are being manufactured in Jaipur with our expert workers specializing in the “slicing” of the tourmaline rough, then sawing it into preforms that are then processed into cabochon or small sized caliberation stones in bulk quantities. Our Thailand factory manufacturers all cut stones from 8×6 ovals up to freesize single piece stones that range from 3-4 carats to 15-20 carat pieces. Multi tourmaline is currently being stocked in more than 100 lots, each lot has an average carat weight. For example a recent lot as attached below is of 7 carats average and is a 1500 carat lot, which has more than 200 pieces included. Most of our Multi tourmaline does not contain any “dead” stones, sorry but stones that are very dark and unsellable specially after placing into jewellery. Very dark stones have much less value in Multi Tourmaline and that’s why we have a mix of lots in all colors. Some stones are bright and some are darker than average, but not completely light or completely dark stones. All stones are cut to save weight as well as make them look beautiful, to find the perfect balance. All stones are well repolished at our factory in Thailand that cut these beautiful Wholesale Multi tourmaline freesize stones. 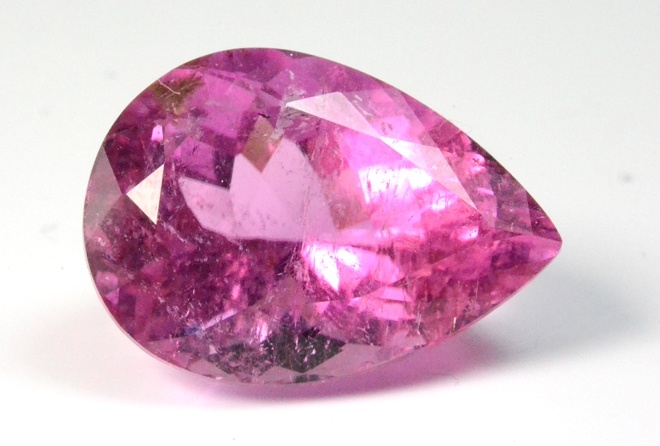 Pink tourmaline in wholesale quantities was one of the most selling products in 2013’s market and it sells well because Ruby isn’t the right stone. Pink Diamonds will always sell better than Red Diamonds and the Pink Tourmaline is usually found in all shades and all types of qualities, mostly the very nice Pinks like in the first picture below sells the most. But again its about preferences, some customers like off shades, some like more Red in their Tourmalines and some just like them to be perfectly “Pink” Tourmalines. Email us today to Buy Pink Tourmaline from a wholesaler like us. 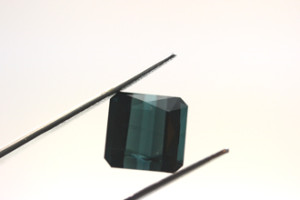 Buy our Green/Green Blue Tourmalines straight from our manufacturing units in Thailand Wholesale Green Tourmaline can be sourced also in calibration as well as freesize. We have from 3 mm up to 10 mm in rounds, ovals, cushions, pears, octagons, heartshapes, trillions and all other shapes. We also have very nice Green Tourmaline (one of the most common colors in multi tourmalines). Please see some photos below of Green Tourmaline at wholesale prices, contact us for this. Also below are one of the most famous Tourmalines which are most priced – Blue/green Tourmalines (Also known as Indicolite tourmalines) and if it the pieces are purely “BLUE” then thats what we call the best “Blue Tourmalines” which are the most expensive out of all. We have been selling Tourmaline Cabochons at wholesale prices in small to big sizes. The 5mm, 6mm, 8mm are widely used in jewelry however we produce every size from 2mm to 12mm in all different colors. We have a distinct customers’ market like the Sliver Jewelry Manufacturers, Gold Jewelry Manufacturers, gemstone collectors and personal users, so we make different qualities from A grade to Gem quality. Contact us for Wholesale Loose Faceted Tourmaline and Cabochons and make us your one stop gemstones’ supplier. Here is another Color chart of Tourmaline for finding all the different shades of Tourmalines. © 1987-2020 Navneetgems.com all rights reserved.